Since Polk State’s Physical Therapist Assistant program began in 1994, graduate surveys have shown that 100 percent of students who complete the program and pass the national licensure exam are employed in the field within six months of graduation. PTA Program Linkage Application period begins February 1, 2019. Open Application period begins March 1, 2019. Click here for the Online Application Process. Welcome and thank you for stopping by and visiting our website today. We hope this website provides you with answers to your questions about the Physical Therapist Assistant (PTA) Program at Polk State College, Winter Haven campus. The purpose of the Physical Therapist Assistant (PTA) Program is to graduate students with knowledge, clinical competency, and integrity to positively impact their patients and profession. As an integrated two-year curriculum, the program offers the students the opportunity to earn an Associate of Science degree with immediate entry into a rewarding career upon successful completion of the licensure exam. The PTA Program prepares students for careers as members of the health care team who provide direct patient care under the supervision of a licensed Physical Therapist. The PTA provides treatment to patients with various diagnoses to relieve pain and/or improve function via therapeutic application of heat, cold, light, water, electricity, sound, massage, exercise, gait, and functional activity. Polk State College’s Physical Therapist Assistant (PTA) program will be the number one program of its kind through innovation, value, and engagement. Its graduates will be the top choice for employers to hire and the program will be recognized for its excellence. 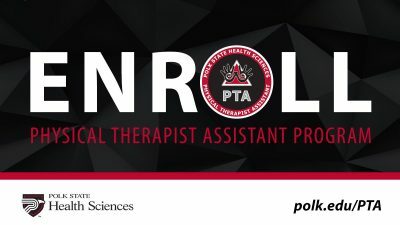 The mission of Polk State College’s PTA Program is to graduate students with the knowledge, clinical competency, and integrity to positively impact their patients, the physical therapy profession, and to transform their lives. The program provides students access to an affordable degree with immediate entry into a rewarding career upon successful completion of the licensure exam. The following philosophy reflects the beliefs of the academic and clinical faculty and Advisory Committee of Polk State College’s PTA Program. Role of the Physical Therapist Assistant: The physical therapist assistant is an active participant of the health care team and provides direct patient care under the supervision of a licensed physical therapist. The physical therapist assistant may be employed in a variety of settings in which his or her role is to actively assist the physical therapist in the treatment of patients with various injuries, diseases, and functional limitations. The physical therapist assistant is involved in promoting awareness of the profession and an interdisciplinary approach to health through education of the patient, family, and community. 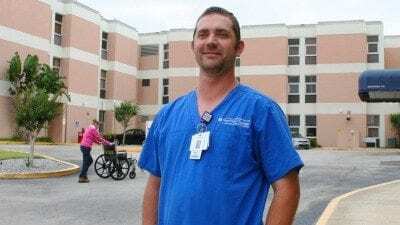 Conduct: The physical therapist assistant adheres to the Code of Ethics and Standards of Conduct set forth by the American Physical Therapy Association and abides by the laws set forth by the Florida State Board of Physical Therapy Practice. The program is committed to instilling in its students a sense of professionalism and pride in clinical excellence. Equal Access/Equal Opportunity: Polk State College’s PTA Program supports cross-cultural diversification within the program and profession and advocates equal opportunity for all students regardless of race, color, national origin, ethnicity, gender, age, religion, sexual orientation, marital status, veteran status, genetic information, disability*, or pregnancy. Community: The PTA program is dedicated to utilizing community resources and values active input from the community it serves. The clinical component of the program will provide a variety of clinical experiences both within and outside of the community in order to broaden vocational options and enhance students’ personal, social, cultural, and intellectual growth. Education Pursuit: The program adheres to the belief that education is a lifelong pursuit and that continuing education is essential for professional development. The Physical Therapist Assistant Program at Polk State College is accredited by the Commission on Accreditation in Physical Therapy Education (CAPTE), 1111 North Fairfax Street, Alexandria, VA 22314; telephone: 703.706.3245; email: accreditation@apta.org; website: capteonline.org. If you need to contact the program directly, please contact Dr. Anna Evans, PTA Program Director at 863.669.2904 or by email at aevans@polk.edu. Accredited status was achieved on May 2, 2012. The PTA program is a 74 credit-hour AS degree program, which trains and qualifies graduates to work in the field of rehabilitation. Students seeking admission must first be admitted to the college and complete prerequisite courses. The PTA program is offered on the Winter Haven campus. Classes are scheduled Monday through Thursday and include both day and evening hours. Program requirements are rigorous. Students must make the commitment to ensure success.